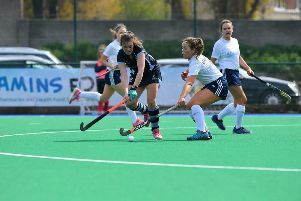 There was disappointment for three Banbridge hockey stars today. Eugene Magee, Stevie Dowds and Drew Carlisle were part of the Ireland squad that lost out to Australia in the quarter-finals of World League Three. A win would have seen the Green Machine into the Olympics next year. Now they face classification matches to decide between fifth and eigth and know a fifth place finish might still be enough to secure their seats on the plane to Rio. In the end, the world number one side won 4-0 but such a score-line fails to portray how close Ireland came. At 1-0 down, Alan Sothern has a fantastic chance to equalise for the Green Machine but the Australian goalkeeper did enough to prevent the equaliser. It was a match dominated by the Australians but Ireland had their chances, which just wouldn’t go their way. Eugene Magee even had an opportunity to get on the score-sheet at 2-0 but his rebound from a corner was well stopped by the goalkeeper. In the final five minutes, Australia added a cruel double before Shane O’Donaghue netted a consolation for Ireland. Ireland no drive for fifth place in the classification matches on Friday and Sunday.